Tri-Arc 8 Step Vertical Steel Ladders, 84" Rung to Rung, Overall Width 18", 7" Standoffs, 400 lb. Weight Capacity. Cotterman 4 Step Fixed Steel Ladders, 3' 3" Overall Length, 20" Outside Ladder Width, 400 lb. Weight Capacity. Cotterman 5 Step Fixed Steel Ladders, 4' 3" Overall Length, 20" Outside Ladder Width, 400 lb. Weight Capacity. Cotterman 6 Step Fixed Steel Ladders, 5' 3" Overall Length, 20" Outside Ladder Width, 400 lb. Weight Capacity. 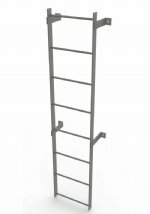 Cotterman 7 Step Fixed Steel Ladders, 6' 3" Overall Length, 20" Outside Ladder Width, 400 lb. Weight Capacity. Cotterman 8 Step Fixed Steel Ladders, 7' 3" Overall Length, 20" Outside Ladder Width, 400 lb. Weight Capacity. Cotterman 9 Step Fixed Steel Ladders, 8' 3" Overall Length, 20" Outside Ladder Width, 400 lb. Weight Capacity. Cotterman 10 Step Fixed Steel Ladders, 9' 3" Overall Length, 20" Outside Ladder Width, 400 lb. Weight Capacity. Cotterman 11 Step Fixed Steel Ladders, 10' 3" Overall Length, 20" Outside Ladder Width, 400 lb. Weight Capacity. Cotterman 12 Step Fixed Steel Ladders, 11' 3" Overall Length, 20" Outside Ladder Width, 400 lb. Weight Capacity. Cotterman 13 Step Fixed Steel Ladders, 12' 3" Overall Length, 20" Outside Ladder Width, 400 lb. Weight Capacity. Cotterman 14 Step Fixed Steel Ladders, 13' 3" Overall Length, 20" Outside Ladder Width, 400 lb. Weight Capacity. Cotterman 15 Step Fixed Steel Ladders, 14' 3" Overall Length, 20" Outside Ladder Width, 400 lb. Weight Capacity. Cotterman 16 Step Fixed Steel Ladders, 15' 3" Overall Length, 20" Outside Ladder Width, 400 lb. Weight Capacity. Cotterman 17 Step Fixed Steel Ladders, 16' 3" Overall Length, 20" Outside Ladder Width, 400 lb. Weight Capacity. Cotterman 18 Step Fixed Steel Ladders, 17' 3" Overall Length, 20" Outside Ladder Width, 400 lb. Weight Capacity. Cotterman 19 Step Fixed Steel Ladders, 18' 3" Overall Length, 20" Outside Ladder Width, 400 lb. Weight Capacity. Cotterman 20 Step Fixed Steel Ladders, 19' 3" Overall Length, 20" Outside Ladder Width, 400 lb. Weight Capacity. EGA Products 7 Step Steel Vertical Walk-through Ladders, 42" Walk-through Style Handrails, 74" Top Rung Height, Total Outside Width 21", 300 lb. Weight Capacity. EGA Products 8 Step Steel Vertical Walk-through Ladders, 42" Walk-through Style Handrails, 86" Top Rung Height, Total Outside Width 21", 300 lb. Weight Capacity. EGA Products 9 Step Steel Vertical Walk-through Ladders, 42" Walk-through Style Handrails, 98" Top Rung Height, Total Outside Width 21", 300 lb. Weight Capacity. EGA Products 10 Step Steel Vertical Walk-through Ladders, 42" Walk-through Style Handrails, 110" Top Rung Height, Total Outside Width 21", 300 lb. Weight Capacity. EGA Products 11 Step Steel Vertical Walk-through Ladders, 42" Walk-through Style Handrails, 122" Top Rung Height, Total Outside Width 21", 300 lb. Weight Capacity. EGA Products 12 Step Steel Vertical Walk-through Ladders, 42" Walk-through Style Handrails, 134" Top Rung Height, Total Outside Width 21", 300 lb. Weight Capacity. EGA Products 13 Step Steel Vertical Walk-through Ladders, 42" Walk-through Style Handrails, 146" Top Rung Height, Total Outside Width 21", 300 lb. Weight Capacity. EGA Products 14 Step Steel Vertical Walk-through Ladders, 42" Walk-through Style Handrails, 158" Top Rung Height, Total Outside Width 21", 300 lb. Weight Capacity. EGA Products 15 Step Steel Vertical Walk-through Ladders, 42" Walk-through Style Handrails, 170" Top Rung Height, Total Outside Width 21", 300 lb. Weight Capacity. EGA Products 16 Step Steel Vertical Walk-through Ladders, 42" Walk-through Style Handrails, 182" Top Rung Height, Total Outside Width 21", 300 lb. Weight Capacity. EGA Products 18 Step Steel Vertical Walk-through Ladders, 42" Walk-through Style Handrails, 206" Top Rung Height, Total Outside Width 21", 300 lb. Weight Capacity. EGA Products 20 Step Steel Vertical Walk-through Ladders, 42" Walk-through Style Handrails, 230" Top Rung Height, Total Outside Width 21", 300 lb. Weight Capacity. Cotterman 2 Step Steel Walk-thru Ladders, 1' 6" Overall Step Height plus 42" Handrails (Total Ladder Height: 60"), 24" Inside Ladder Width, 400 lb. Weight Capacity. Cotterman 3 Step Steel Walk-thru Ladders, 2' 6" Overall Step Height plus 42" Handrails (Total Ladder Height: 72"), 24" Inside Ladder Width, 400 lb. Weight Capacity. Cotterman 4 Step Steel Walk-thru Ladders, 3' 6" Overall Step Height plus 42" Handrails (Total Ladder Height: 84"), 24" Inside Ladder Width, 400 lb. Weight Capacity. Cotterman 5 Step Steel Walk-thru Ladders, 4' 6" Overall Step Height plus 42" Handrails (Total Ladder Height: 96"), 24" Inside Ladder Width, 400 lb. Weight Capacity. Cotterman 6 Step Steel Walk-thru Ladders, 5' 6" Overall Step Height plus 42" Handrails (Total Ladder Height: 108"), 24" Inside Ladder Width, 400 lb. Weight Capacity. Cotterman 7 Step Steel Walk-thru Ladders, 6' 6" Overall Step Height plus 42" Handrails (Total Ladder Height: 120"), 24" Inside Ladder Width, 400 lb. Weight Capacity. Cotterman 8 Step Steel Walk-thru Ladders, 7' 6" Overall Step Height plus 42" Handrails (Total Ladder Height: 132"), 24" Inside Ladder Width, 400 lb. Weight Capacity. Cotterman 9 Step Steel Walk-thru Ladders, 8' 6" Overall Step Height plus 42" Handrails (Total Ladder Height: 144"), 24" Inside Ladder Width, 400 lb. Weight Capacity. Cotterman 10 Step Steel Walk-thru Ladders, 9' 6" Overall Step Height plus 42" Handrails (Total Ladder Height: 156"), 24" Inside Ladder Width, 400 lb. Weight Capacity. 7 Step Steel Tank Access Ladder, 84" Height, Blue Powder Coated Steel. 10 Step Steel Tank Access Ladder, 120" Height, Blue Powder Coated Steel. 12 Step Steel Tank Access Ladder, 144" Height, Blue Powder Coated Steel. 15 Step Steel Tank Access Ladder, 180" Height, Blue Powder Coated Steel.